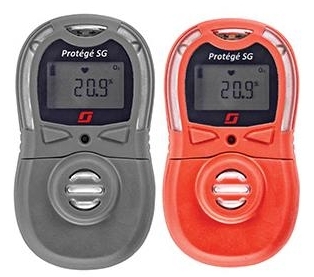 The Protégé SG is extremely user-friendly with simple one-button activation, adjustable alarm settings and an easy-to-read display.Additional features include data logging and a customizable LCD display capable of displaying real-time gas readings and universal icons for global use. Replaceable lithium batteries provide unlimited life. Maximum Flexibility: Users can change sensors on the go and the monitor will automatically recognize the sensor type and update the gas label on the display.No programming is required when switching sensors. Easy To Use: With one-button activation, adjustable alarm settings and an easy-to-read, multi-language display, the Protégé SG is intuitive and user-friendly. Turn it on, and the monitor does the rest. Durable and Reliable: The Protégé SG is available in IP66/67 ingress protection. Using a lithium replaceable battery provides service life of one and a half to two years for toxic sensors and two months for low power LEL. The sturdy case can withstand the rigors of most industrial environments and is reliable.